Bali is synonymous with beaches, palm trees and lush rainforests. It’s no wonder it is popular with honeymooners, luxury travellers and backpackers alike. However, a new breed of traveller is favouring rice paddy over beach and mountain cycle over the surf. Ubud has been growing in popularity in recent years with more and more luxury hotels moving in. The draw for these hotels in Ubud is a combination of the ‘cool’ art scene that Ubud offers mixed with the yoga and wellness retreats of the surrounding areas. Travellers seeking a real slice of Indonesian culture, mixed with experiential activities have started flocking. Visitors can start the day with a yoga session, cycle to (and then inside) a nearby volcano, and take in the sites of the surrounding temples and rice paddies. 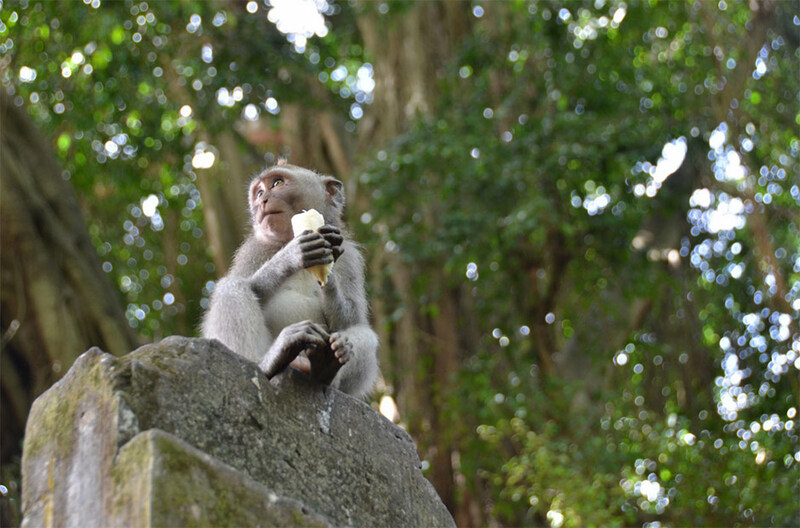 For animal lovers, there is a vast monkey sanctuary in which around 600 macaque (or Balinese long-tailed monkey) roam around crumbling temples. The whole experience feel right out of an Indiana Jones movie. For the less active there is a range of cooking classes and trips to local vendors to source and cook traditional food and healthy dishes. Many of the Ubud hotels also have extensive spa facilities to truly relax. Perhaps the ‘coolest’ part of Ubud is the artistic town itself. The town feels is akin to Brighton in the UK, or Haight Ashbury in San Francisco in that it is full of art, artists and an array of sculptures and handcrafted gifts. And we are not talking the the low quality junk you might find at the beach. Many of the items are pieces that you would be happy to showcase at home. As the sun sets over the rainforests, the ‘coolness’ continues as there is an array of hip restaurants, well maintained (yet culturally aware) bars to enjoy. However, the best experience has to be the Kecak ‘fire and trance’ dance, which is also known as the Kecak monkey dance. This unique and striking experience takes place as the sun sets and the use of chanting, fire and dance is like nothing you will ever experience and feels truly balinese. So, if an adventure with gentle exercise, relaxation, temples, monkeys and art, all set on an authentic balinese backdrop then join the coolest of travelers in Ubud.